Summary: A fantastic new inflatable hot tub from Intex PureSpa foe 2015, ideal for up to 4 people and looks great, and feels great! New for 2015 from Intex is the Octagonal Jet & Bubble Therapy Spa hot tub, an Octagonal inflatable spa ideal for up to 4 people to enjoy. This hot tub has a Built-in Electronic Hard Water Treatment System, comes with 4 fantastic Massage Jets as well 120 Heated Bubble jets for everyone to enjoy. 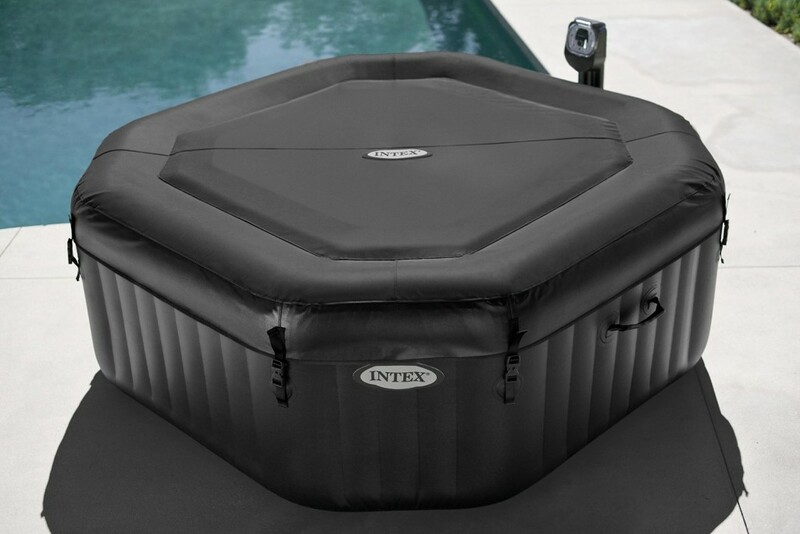 The Intex is the Octagonal Jet & Bubble Therapy Spa also has a built-in Natural Chlorine Saltwater System perfect for keeping your hot tub clean and well maintained. The spa comes with a 5mm protective base, it is easy to set up and install as it self inflates with the built in pump that it comes with. 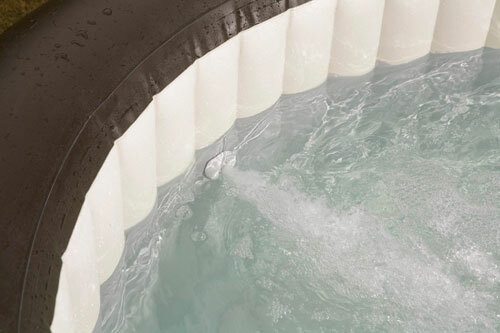 This inflatable hot tub has 4 powerful Massage Jets as well 120 Heated Bubble jets built in, all of these can be controlled by the panel that is raised up on the side of the spa as you can see in the image below. Easy to use waterproof controls with a flip down use for when not in use to protect from outdoor debris. Here you can adjust the jets and temperature. 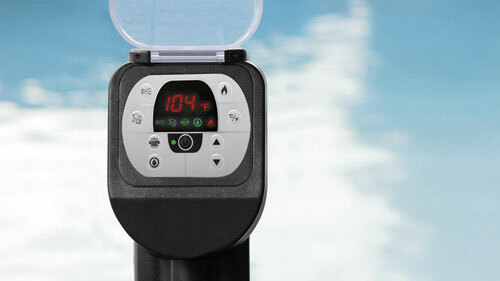 The spa will heat to between 68° – 104° and hold up to 795L of water. Once inflated the spa’s approximate size is 2.01m outside and 1.50m on the inside, ideal for up to 4 people. This Intex PureSpa also includes a built-in hard water treatment system which is ideal if you know you live in a aged water area. 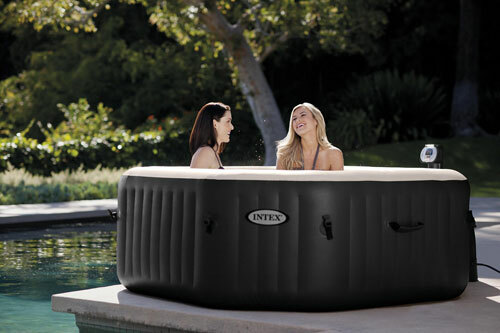 The Intex Octagonal Bubble Spa Hot Tub is perfect for up to 4 adults, making it ideal for couples or small families. The octagonal design makes it perfect for being placed in a corner up against the house wall, or having a gazebo over it. Ideal for people who wish to have in a corner next to the house perhaps. Powerful jets. The hot tub self inflates. Includes a built-in hard water treatment system. Overall it looks great too. The cost, although new to the market it is a lot more than others to choose from. Cover straps with child security lock. Why an Inflatable Hot Tub over a traditional garden jacuzzi spa? No plumbing required, so it can be easily filled and emptied using a hose pipe. No special electrical installation required on your circuit board as inflatable hot tubs plug straight into the mains via a normal plug socket just like any other appliance. They can be quickly deflated and put away saving garden space when not needed and then brought our again next summer. 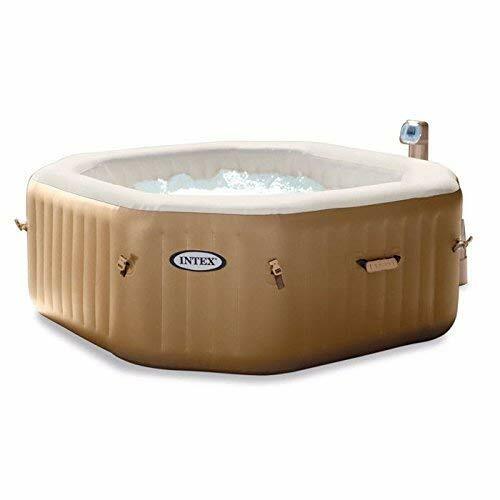 The Intex is the Octagonal Jet & Bubble Therapy Spa hot tub is a fantastic new hot tub and perfect for 2015, it is comfy, looks great, ideal for most spaces and perfect for 4 people to enjoy in the summer, or to relax in, in the evening after work. The jets are great and it is very steady and robust. Our only criticism is the price tag, although better than others on the market the price point is a lot higher. Apart from that though it is a fanatic inflatable hot tub perfect for the summer. Where can I buy this since Amazon doesn’t have it ? An Amazon seller has it on for that price.